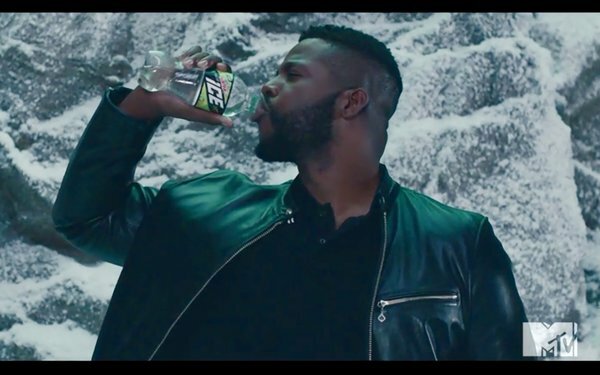 The brand sought to amplify Mountain Dew ICE’s launch in 2018 MTV Movie & TV Awards (MATVA) through a multi-platform marketing campaign to generate product awareness and purchase consideration among ages 18-24, multi-cultural consumer segment. It also wanted to position Dew ICE as the catalyst to fueling spontaneous moments and clever humor and to highlight the clear and refreshing attributes of Dew ICE. Inspired by 2018’s biggest film and TV hits and fan-favorite genres, Viacom produced a comedic movie parody campaign, “Movie Dew-Overs” — celebrating classic movie and TV tropes with refreshing twists. Dew ICE had a starring role, serving as the punctuation point in thematic scenes from popular super hero and Medieval genres (akin to “Black Panther” and “Game of Thrones”), literally flipping the script and/or outcome of scenes to surprise fans with unexpected endings. Hollywood actor and MATVA nominee Winston Duke (seen above) served as the creative through-line, delivering contextual relevance to the show and comedic relief and spontaneity that aligned with Dew ICE’s core brand attributes. To authentically align Dew ICE with the MATVA, it developed long-form (:60-75) cinematic-style content that felt more like the show and less like commercial or advertising creative. It harnessed MTV/Dew/Duke’s scale for content distribution. In the lead-up to the show and at the height of industry and consumer buzz, MTV/Dew/Winston released :60 Medieval-themed content across TV and social screens, teasing “Movie Dew-Overs” series. On the day of the show, Duke was interviewed on the red carpet, discussing the success of “Black Panther” and teasing Dew ICE creative premiering that night. “Medieval” (:60) & “Super Hero” (:75) aired in “True A” positions following contextual moments in show. MTV/Dew/Winston posted spots across social. After the show and after “Black Panther” won Movie of the Year, Duke received significant press coverage and shared excitement for Dew ICE campaign across social. “Super Hero” creative drove highest viewership out of all commercial spots in the entire broadcast. The program delivered 37 million+ social impressions and 6 million+ video views. Fans organically shared program content across social, earning an estimated 844K impressions. Use humor to engage teens and members of Gen Z. Heavy social media use will pay off, especially when people share your content. Enlist a brand spokesperson who authentically aligns with your product’s core attributes. This was a finalist in the Brand Entertainment: Brand Placement category in MediaPost’s 2018 Creative Media Awards.